Much of what gets written about leaders, and has been written, has to do with trout – a source of confusion. It’s the terminology and measurements: 2X, 9X, .010-inch diameter and building a leader .016 @7-inches and so on. As you know, Xs correspond to diameter, not pound test/breaking strength. But, for example, a 4X material is supposed to be .007” in diameter and supposed to have a breaking strength of 4.3-pounds (size-6 to size-14 flies), 0X is supposed to be .011” in diameter and supposed to have a breaking strength of 9-pounds (size-4 to size-6 flies). So, a simple rule of thumb is the higher the number, the thinner the diameter (using X). George Anderson – Yellowstone Angler goes about the business of testing leader materials. You can visit his Leader Shootout by clicking on the image. The 12X material from Company A may well have a different breaking strength than the 12X material from Company Y. Why? Even if the diameter is the same doesn’t mean that the strength is equal – companies use different chemical formulations, and the result is widely different characteristics which not only includes strength but abrasion resistance, stiffness, water absorption, stretch and so on. For the grizzled hand crowd, those that fish the salt, the leader sizes are almost always measured in pound test. There too is the conundrum of not being equal. Brand X 16-pound test may test out at 15-pounds and brand B at 17-pounds. The diameters, crediting the same X pound test can also be different. Here again, there are factors of suppleness, stiffness, abrasion resistance, water absorption, UV degradation, visualness in the water and other factors. In pound test line, it’s the higher number that’s thicker – 40-pound is thicker in diameter than 20-pound. Monofilament, braided, and fluorocarbon are different leader materials. Furled, knotless-tapered, and knotted single strands of differing diameters are types of leader constructions. Tippets, the thinnest material portion of a leader, usually link to the fly but do not necessarily in the salt. In saltwater toothy and abrasive (sharks, tarpon, billfish) comes into play so to protect the tippet – thicker, stronger shock tippets of mono, wire or fluorocarbon are added. Guides and Captains, almost to a man or woman, seem to prefer hand tied leaders. A few will “allow” furled in certain situations, but none (we know of ) will go near a knotless leader. Knotless leaders are expensive and retie of tippet finally reaches so far up the leader that you’re trying to tie 5X to the remainder of the knotless leader where it’s 18-pound test. So, that too short knotless is discarded and requires a new one, plus a tippet tie on. Expensive, time consuming and a pain in the arse. Furled leaders. Click on image to visit Blue Sky furled leaders. You can ask 12 guides and captains in Montauk about leader knots and get a dozen different answers. Go to New Zealand, all different answers. The Bahamas, all different answers. The Florida Keys, all different answers. Which one is right? They’re all right. A professional guide or captain has been through the mine-field on knots. They don’t tie on something that does not hold. If you get on board and the guide or captain clips your leader off, stay calm. He or she will retie it for you, and it won’t fail. That’s the whole point – just say thank you. Hint: If the knots you’ve been using hold, and you’re not fishing with a guide or captain, don’t change – no matter what the “expert” says. The most dangerous knot, the one that causes the most failure is called a wind knot. Wind knots outnumber other failed knots by 20-1 (I’m guessing). The wind knot break experience is the one not seen. Observed, however, it should get replaced… right now. The other trouble spots are either ends of the tippet. So, as you can see, leader choices and builds have a significant impact on your fishing habituation – no matter that it’s a delayed harvest rainbow trout the length of your hand or a 75-pound Guatemalan sailfish bounding over wave tops faster than a speeding bullet. A tenkara rod, switch rod, bamboo rod, fiberglass rod, graphite rod or even one made out of Kryptonite faces the same dilemma when it comes to construction of a leader – you! Tie-Fast Tool instructions. Any fly shop will have this tool – less than $20. Learning curve, none. Ties a nail knot, joins two disimiliar lines, leader to tippet ring, and fly to tippet. Each tie takes just seconds. 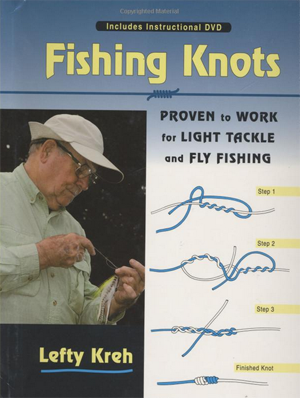 Editorial staff adventures with leaders mostly started by going by the book.The formulae ties as described by Lefty Kreh used in freshwater and saltwater setups. Then, venturing off to new leader ties learned from grizzled Florida Keys guides – straight 40-pound (or 20-, 30-or whatever) mono to fly. Then romances with furled followed by a return to self-tying a multi-knot leader, and then, falling off the wagon completely and getting way too lazy by going knotless. And of course, having affairs all along with several fluoro brands, bad associations with braided (in fly fishing), and multiple engagements with all manner of mono-brands. Tippet rings are sold at any fly shop. They come in various packages but generally with both 2mm and 3mm sizes. Less than $10. Tippet rings, the Tie-Fast tool and knotless leaders (furled, knotted as well) have become a welcomed relief from wasting leader material, lost time with change outs, and getting on the failsafe side of knots. A Tie-Fast tool-made knot never fails (at the knot) because, tied correctly, the tag end is wrapped by every turn. The tighter the pull, the tighter the lock on the tag – it’s a nail knot. The tool makes perfect knots speedily and in unfriendly conditions like wind, pitching cockpit of a rough sea in Montauk, low light, cold and wet hands. Tippet rings are good to go in saltwater and freshwater. They can be used for everything from marlin to crappie. Why? Think saving a lot of money, real easy to tie – fast, and think failsafe. With a tippet ring, you only change the tippet portion – there’s no chopping off, shorten, shorten, shorten so that your 7X ties to a 20-pound test line. The knot bible by Lefty Kreh. It now comes with a DVD video to make life simpler. Click on image to buy the book at Amazon. Well, they are small 2mm and 3mm diameter nickel alloy metal. They float so fuss-buckets can rest assured that dry flies and nymphs are not compromised. Some folks improve their floatation by adding floatant, but it isn’t necessary. Nor is any conversation about casting difficulty worth mentioning. 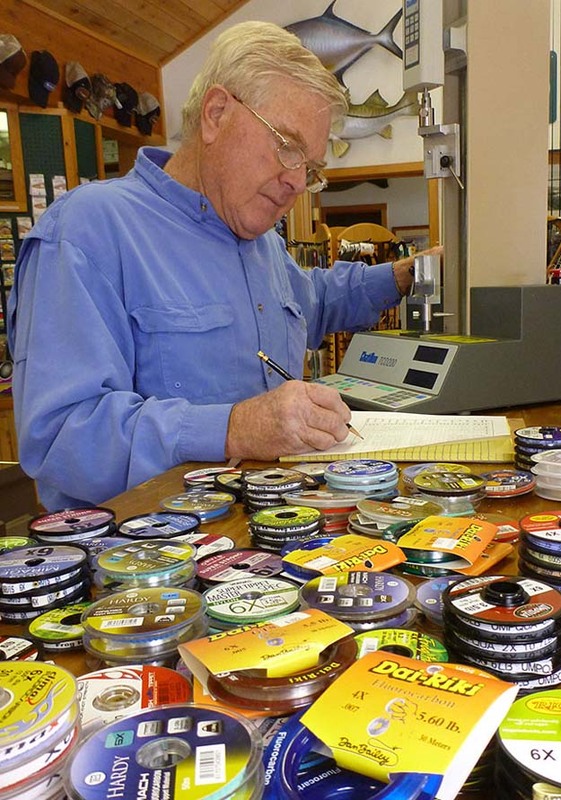 Lefty Kreh is all-in on tippet rings – ’nuff said. Tippet rings come rated 25- to 30-pounds for 2mm and 3mm, respectively. Most trout scribes caution that rings would not be practical for saltwater big game. Malarkey, an International Game Fish Association (IGFA) ruling declares the pound test limit for fly fishing is 20-pounds. That’s for billfish of any denomination: sailfish, blue marlin, black marlin and striped marlin… all of which get caught on a fly every year with many times on less than 20-pound test tippets. For example, the world record (IGFA) for Pacific blue marlin on a fly is 288lbs, 12oz – caught on 20-pound test tippet in Australia in 2002. For Pacific sailfish (IGFA world record) it’s 136-pounds, caught using 12-pound test tippet by Florida Keys legend Stu Apte fishing in Pinas Bay, Panama in 1965.